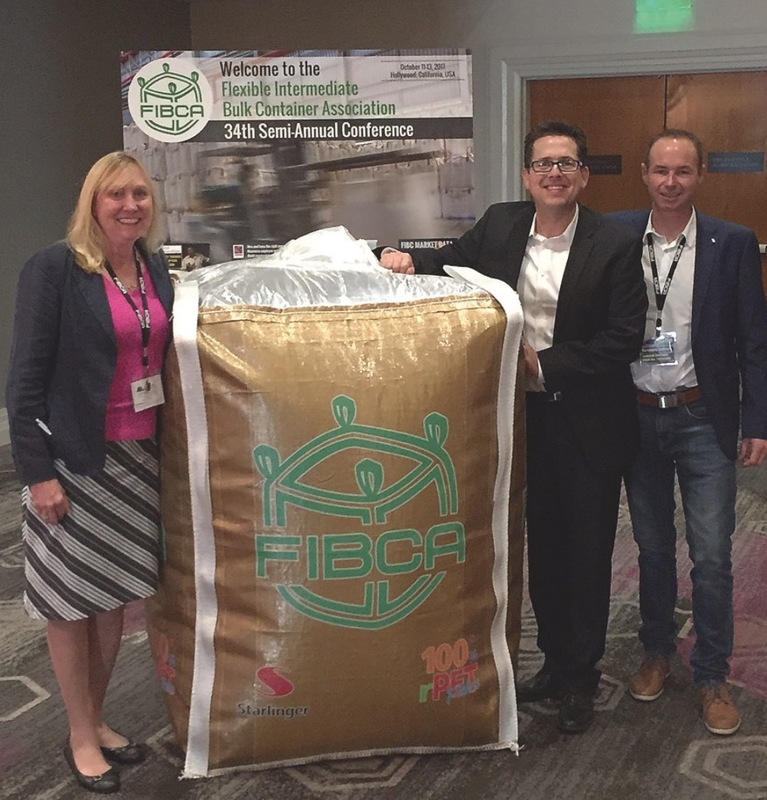 The Flexible Intermediate Bulk Container Association (FIBCA) hosted its 34th conference in California, USA, from October 11-13, 2017. Among the attendees was Austrian-based manufacturer Starlinger & Co. GmbH, who specializes in machinery and process technology for woven plastic packaging production and PET recycling and refinement. Jointly with its US headquarters American Starlinger-Sahm, Starlinger presented a golden FIBC made from 100 % PET bottle flakes. More than 100 participants from over 25 countries attended the 34th semi-annual conference of FIBCA in Hollywood. Starlinger seized this opportunity to present a golden FIBC made from 100 % rPET bottle flakes during the event; the company’s “bottle-to- bag” technology had already been introduced with great success at Interpack in Europe early in 2017. Building on its vast know-how in the area of PET recycling and refinement, Starlinger spent years developing and refining the process technology for the production of fabric from PET flakes. Initial trials were performed with virgin material; the next step involved the use of recycled PET (rPET pellets). After successful trials, Starlinger moved on to produce tapes, and consequently fabric, from PET bottle flakes. The fabric used for the golden FIBC (the golden color results from the use of beer bottles) is manufactured on a tape extrusion line type starEX 1600 PF with twinTAPE precision cross winders and circular weaving looms type FX. The use of PET has many advantages. Heavy-duty fabrics benefit from the extreme resistance and shape stability of PET (the material maintains its modulus and strength at temperatures up to 80°C / 80.0°C and has excellent creep resistance). But bags made from PET are not only durable, they are also recyclable: After their use, PET bags may be recycled and reused in packaging production. “The use of PET in bag production is no substitution for PP, but it will open new markets to our customers due to the environmentally-friendly nature and low carbon footprint of bags produced with our technology,” says Reinhard Lechner, Product Manager PET Applications at Starlinger. “Especially brand owners and blue chip companies recognize the need to include recycled material in their packaging.” This trend is clearly visible in the United States. In 2015, the collection rate of PET bottles was at 31.1 % (US National Postconsumer Plastic Bottle Recycling Report); organizations such as the Ellen MacArthur Foundation support businesses and governments in their transition to a circular economy. Starlinger aims to contribute to these efforts: By the end of 2018, rPET fabric will be commercially available on the market in Europe and America. Starlinger is a Vienna-based engineering company with production sites in Weissenbach and St. Martin, Austria, as well as Taicang, China. As the world’s leading supplier of machinery and complete lines for woven plastic bag production, recycling and PET extrusion and refinement, Starlinger & Co. Ges.m.b.H. is a synonym for leadership in quality and technology in over 130 countries. Founded in 1835, the family-owned business has been exporting machines worldwide for more than 45 years with an export quota of over 99.5 %. American Starlinger-Sahm, Inc. is the US headquarters of Starlinger & Co. GmbH and handles sales/service activities and spare parts supply for Starlinger and the winder specialist Georg Sahm GmbH & Co. KG in the US and Canada. In 2015, Starlinger invested in a new facility for American Starlinger-Sahm in Fountain Inn, South Carolina, to support the woven packaging production equipment, plastic recycling machines, refining equipment and winding technology. Starlinger is positioned to lead and support the future technology for recycled PET flake in the United States, Canada, and the world.